The client is a logistics service provider based out of Middle East. They are the trusted advisors for logistics customers who have a complex fleet and large mobile workforce. The company offers top notch fleet solutions & services world-wide. The IoT Fleet Management solution helps the client’s logistics customers in intelligent decision-making, to effectively manage their fleet of vehicles. Fleet Analytics provide deep insights into Driver Performance, real-time vehicle tracking, predictive maintenance of vehicles and fuel usage trends. This helps with the improvement of operational efficiency. Need fleet management solutions for your business? With over 20 years of experience in the Logistics space, the client’s leadership team was on a constant hunt to leverage emerging technologies; in order to achieve customer delight. Most logistics customers have four main business concerns; real-time tracking & monitoring of vehicles, understanding driving habits of workforce, tracking vehicle idling & fuel usage trends, and predicting vehicle failures. With the existing systems, they had no means to track their fleet of vehicles in real-time; to avoid any breakdown, failure, or delay in their supply chain operations. There were no insights for the companies to understand the driving habits of workforce like harsh braking, cornering, etc., due to which they were unable to put a focus on training and improving the performance of inefficient, unsafe, & discourteous drivers. In addition, they had no means to identify unplanned stops of each vehicle, drive time versus customer service time and vehicle idle time. In addition, their existing system lacked capabilities to track vehicle idling & fuel usage trends to optimize fuel consumption, making it impossible to set up a cost-effective fleet optimization engine. Unexpected failure/breakdown of vehicles resulted in a huge loss in vehicle productivity and maintenance costs. Also, their existing manual process for vehicle repairs and maintenance was time-consuming. Our client wanted to address all these impediments smartly with an efficient fleet management solution that utilizes diagnostic data of the vehicles, drivers and history of unplanned events. And, such data needs to be obtained from installed GPS enabled devices (IoT assets) in the vehicles. These devices provide information such as vehicle speed, engine coolant temperature & RPM, trip mileage/fuel consumption, hard acceleration/brake, engine idle time etc. By analyzing the collected data, a complete picture of real-time operations can be made available. These insights would help them select the most appropriate route, maximize uptime, control costs, and reduce fuel; thereby boosting productivity, increasing operational efficiency, and optimizing fleet. However, to architect such a solution they required an integrated IoT & Data Analytics platform; which supports any kind of device and possesses an ability to perform analysis for critical insights. To create such a robust predictive analytics fleet management solution, they engaged Saviant as their IoT & Data Analytics consulting partner. Saviant’s cold-chain monitoring & logistics expertise helped create an Azure Fleet Management solution that provides intelligent business insights to improve fleet operational efficiency. The solution creates a positive impact on vehicle management, preventive vehicle maintenance, driver performance and overall fleet management. The client’s logistics customers can login to a web portal to track & monitor their vehicles, schedule maintenance activities, supervise driver behaviour and predict asset failure for improved operational efficiency and faster operational support. However, three major challenges were faced while devising the Fleet management solution; how to provide support to any IoT device installed in the vehicle, how to receive data from the respective IoT devices and how to analyze the collected IoT data. Saviant’s team of IoT & Data analytics consultants overcame these obstacles by developing the solution architecture leveraging Microsoft Azure IoT Suite. The IoT gateway supports any kind of IoT devices such as GL213 and 618; which are GPS fleet tracking devices that collect data related to vehicle speed, engine coolant temperature & RPM, Trip Mileage/Fuel Consumption, hard acceleration/brake, engine idle time etc. The Analytics engine used in the solution leverages this collected IoT data to derive real-time & predictive insights and Power BI tool helped to generate various analytics reports for intelligent decision-making. 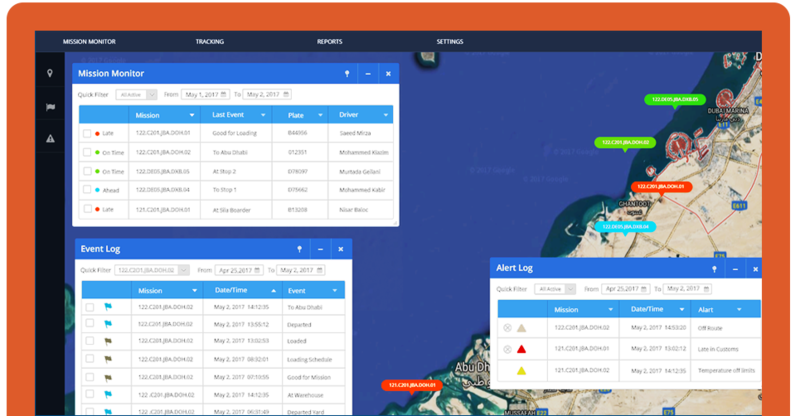 Although this Fleet Management solution was delivered as a proof-of-concept, our Middle East client was impressed on gaining visible potential benefits, one of which includes the solution’s scalability to handle up to 5000 vehicles. Need real-time visibility on your fleet operations?